In the context of short-term, project-based funding, it can be very difficult to sustain a program beyond original or seed funding. Planning for the future and longevity of an initiative is an ongoing process that must begin early. 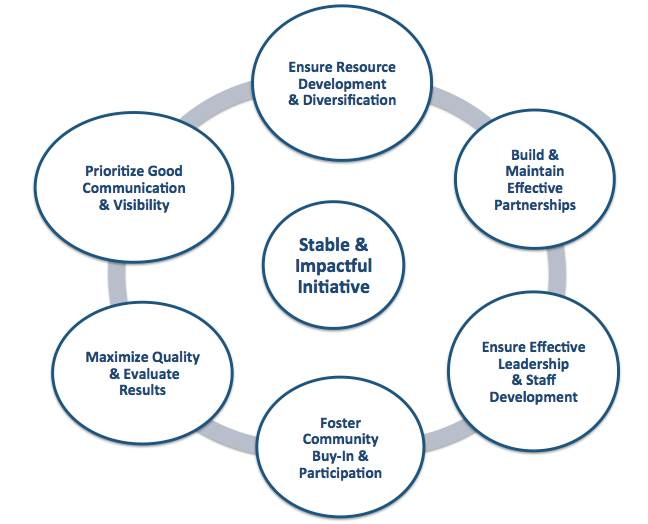 A review1 of sustainability planning for mentoring programs identified six (6) key strategies to keep in mind when striving for sustainability. These key strategies are shown in the graph below1. 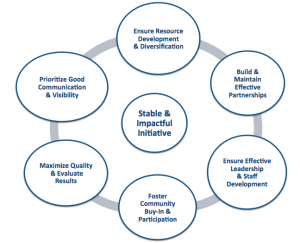 For more detailed information and practical tools related to these six key strategies, refer to this Sustainability Planning Handbook. There is also an interactive workshop that accompanies this Handbook. For more information, contact us.